All has been quiet for a while on my blog now. I thought it had been a couple of weeks since my last update, but no, there it is in that big blue date, the last time I blogged was back on 21 January. Oops. I’ve been stupendously busy. That’s why I haven’t had time for much blogging…but here’s a BIG FAT BLOG UPDATE of everything I’ve been doing recently. 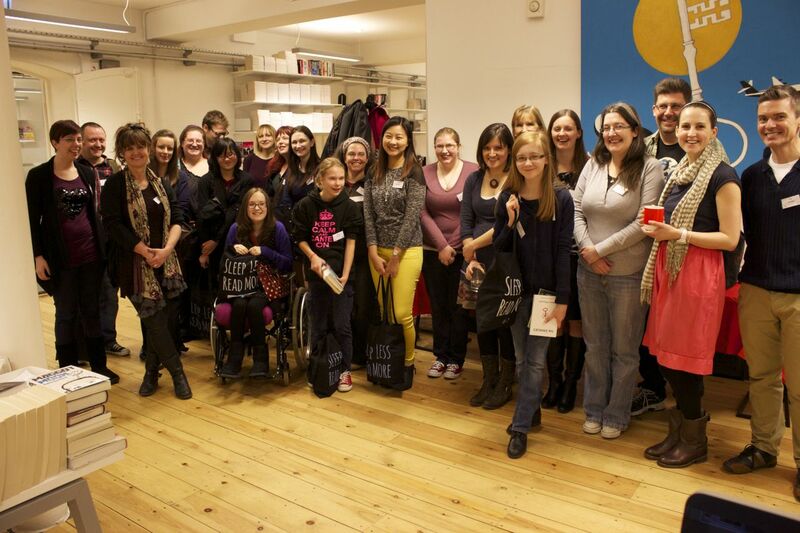 Authors and bloggers at the Templar/Hot Key event. So after my launch in January, I spent a fabulous day in London at a joint event for Templar and Hot Key books, meeting lots of wonderful bloggers and authors. It was brilliant, although all the underground around the area I wanted to get to was shut, sending me into a panic. As soon as I arrive in London I turn into a complete country bumpkin and freak about where to go. (It probably won’t astonish you that in true Suzy P style, I have no sense of direction, to the point where I can probably get lost in my own house.) I’d emailed the lovely Hot Key team beforehand, and they’d sent me very precise instructions about what to do and where to go, and I’d suggested they keep a St Bernard on standby for me in case I did get lost. All of which went to pot thanks to London Underground’s ill-timed engineering work, but I did manage to get there, wasn’t too late, met lots of lovely people and had a marvelous day. I even managed to find my way home again, and the St Bernard wasn’t required. Win! At the event as well as meeting lots of fabulous people, I got a brilliant tote bag with the slogan ‘sleep less, read m ore’ on it, hand-printed by Templar’s talented commissioning editor Helen, that was filled with lots of lovely books. 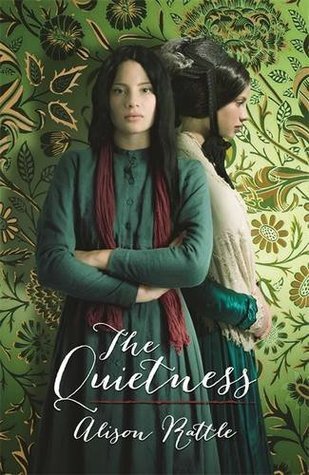 I haven’t read them all yet, due to on-going busyness, but I devoured fellow MA Writing for Young People graduate Alison Rattle’s The Quietness on the train home. January also saw me up against a deadline. The deadline for Suzy P #2 (as yet untitled*) to be exact, and the first draft was due at the end of the month. So I was writing like a demon thing, and still missed the deadline. Ho hum. Let’s move on…I did get it in though, and the edits are back (they liked it, PHEW! ), so I need to get my head down doing all the rewrites. I also had to do my first school event for Suzy. I was lulled in gently, with a small event, of just 200 kids. HEART ATTACK TIME!! That’s a lot of people to be faced with at 9.15 in the morning. I was in a theatre, miked up, on a stage, with my presentation on an enormous screen behind me. But using my quick questions to gauge if it was a success or not (Did I die? Vomit? Fall over? ), the answer to all of the above were no, so I think it went okay! The pupils at the school had loads of really interesting questions afterwards, and were lots of fun to work with. I even had a tour of the school orchid greenhouses afterwards, which was amazing. The school was very modern, only four years old, and the facilities blew my mind. So different to the schools I went to. They had John Barrowman going in the day after me. I can now officially say was John Barrowman’s warm up act! I’ve been to two book launches, both for books published by other graduates of the MA Writing for Young People c ourse I did. First up was Maudie Smith’s hilarious Opal Moonbaby: About Zooming Time, where I got to hear about this fantastic book *and* stuff my face with popcorn, and then last Thursday (World Book Day) I was out to support Marie-Louise Jensen launching her new book, Smuggler’s Kiss. Stunning cover! 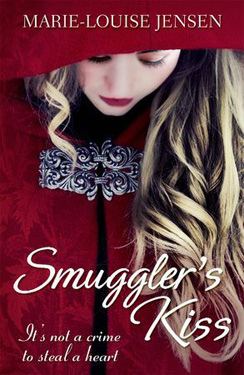 Marie-Louise dressed up as a smuggler for the occasion and I’m really looking forward to reading the book. I’ve also started sewing classes, so much of my time is now spent frowning at bits of cotton. I inherited my Grandma’s sewing machine, and really wanted to learn how to use it, so I’m taking lessons with a great group of people. I’m really enjoying it, although I am a bit rubbish. I’ve not actually completed anything yet, but I’m hoping to finish off my cushion cover as soon as I master pesky buttonholes. And my bunting will be done as soon as I can remember how to change my threads and bobbins. Then I’m going to attempt an apron…so I’ll post pictures when they’re done. (I wouldn’t hold your breath). And then there were winter germs. I was ill for a week. Then Tornado Toddler was ill for a week (he missed World Book Day at nursery. I couldn’t dress him up. Gutted!). So not much work got done for a while. There have been some more lovely reviews for Me, Suzy P online, which is fabulous. And the brilliant Jesse, over at Books4Teens, even created a vlog showing you how to make hot chocolate inspired by Suzy P’s frequent visits to Bojangles café! This is all kinds of awesome. You can see it here. I haven’t tried it yet, but I’m definitely going to, it looks delicious. Plus, I’m going joining the team over at the amazing Girls Heart Books blog, my first post goes up this Friday. I’m really excited about, so keep an eye out for that. Right. I think that’s pretty much everything…for now, anyway. Are you still reading?! It’s been a while. Don’t you have some work to do? *I am rubbish at titles. Anyone got any suggestions?! Suzy 2 is about friendship. 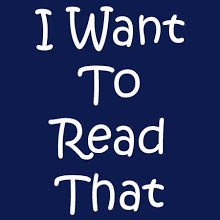 Let me know if you have any ideas…I’ll give you a credit in the acknowledgments! Last Thursday I was very nervous. Very, extremely nervous. Why? Because the day had finally come to launch Me, Suzy P, out into the world. And snow was forecast to come. I had visions of me, standing in a bookshop by myself, watching tumbleweed roll past into a snowdrift. It seemed a very Suzy thing to happen, what with disaster stalking her every move. But…the snow held off just long enough until the next morning, and people came. My lovely friends, and some equally lovely people I’d not met before, ventured out into the night to help me celebrate the release of Suzy into the wild. The inspiration for the book and my most embarrassing moments…EVER! We were at the wonderous Mr B’s Emporium at Bath, and they did SUCH a fantastic job, I couldn’t have asked for better. There were sweets. Oh, so many sweets. 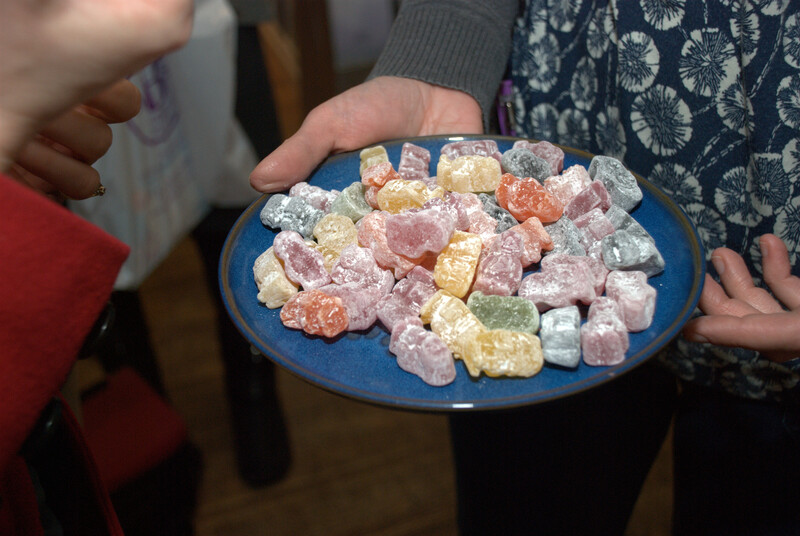 Jelly babies and smarties and flumps and strawberry laces, and everyone was on a sugar high (which is never a bad thing). 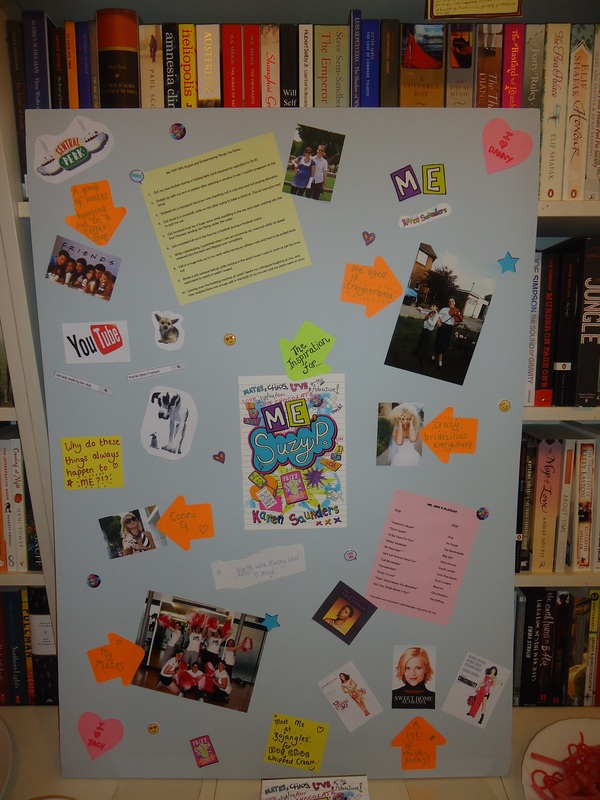 I’d made a mood board which gave people an insight into the inspiration behind Me, Suzy P, which also featured a playlist for the book and my top ten most embarrassing moments. These involve falling over a lot, injuring myself a lot and made me realise I’ve spent a lifetime making an absolute donkey of myself. Ah, happy days. I did my talky bit and although I hate public speaking and wanted to throw up before hand, I didn’t a) die b) fall over c) vomit , so I’m definitely chalking that up as a success. 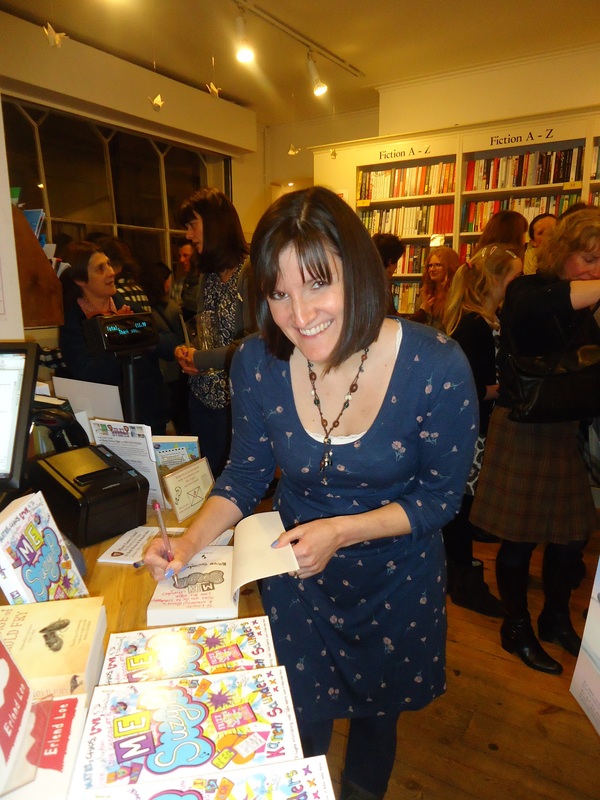 I signed lots of books, so many in fact that my gorgeous sparkly pink pen ran out of ink. It was a lovely evening, and I’m super touched that so many people came out to support me, so if you were one of them, thank you SO much. You rock. It’s the penultimate day of blog tour now, and I’m going to be very sad to leave my imaginary tour bus behind. I’ve got rather attached to it these last few days. (Note to self: get out more). 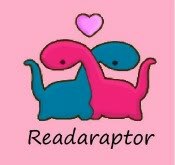 Anyway, today I’m talking about Me, Suzy P over at Readaraptor and giving a low down on Suzy, her mates and some of her family. You can also read Readaraptor’s lovely review of the book. Wanna find out more? Then clicky here to be taken to the Readaraptor site. 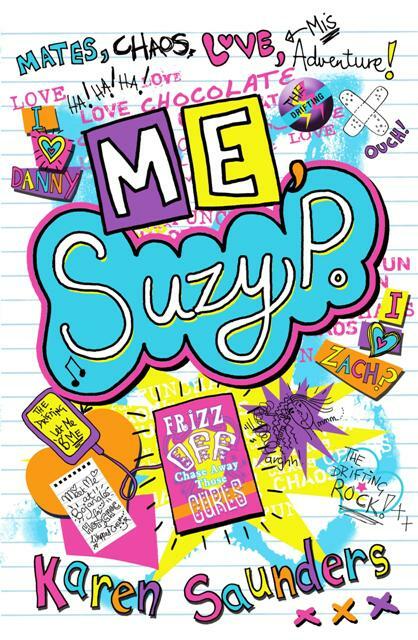 Today the Me, Suzy P Blog Tour tour bus* cruises to a stop at I Want to Read That. Read the wisdom of Suzy P as she offers her suggestions for avoiding embarrassment in public. Although she’s possibly not the best such person to be giving this advice, as she embarrasses herself constantly. There’s also a lovely review of the book, too. *I’ve totally created a fictional tour bus for myself to travel around in while I’ve been doing this. It has lots of beds, books and chocolate in it. Day two of my blog tour and I’m over at the lovely Bookster Reviews. You can read an extract from Me, Suzy P – the entire first chapter, in fact. Just enough to whet your appetite. This week I’m off on a blog tour, whizzing around the internet talking about all sorts of things related to Me, Suzy P. I’ve got my rider ready (red M&Ms only, Wensleydale cheese, some cute Labrador puppies to play with) and I’m kicking off at the fantastic Chicklish website. Chicklish has a place very close to my heart, as I used to review on this site many moons ago. It’s run by the lovely Luisa Plaja, who writes great teen books you should check out. I’ve written a blog post for the Chicklish Gimme Five! slot, so head over to the website here where you can find out my top five influences for Me, Suzy P. There’s also a chance to see a very funny video where a large dog takes an old lady for a walk. It will make you laugh. Guaranteed.